These pieces encrusted with various organic residues, bi-products typical of bronze corrosion. Several large restorations conducted in the past appear evident on the surface. The iron is in extremely fragile condition. These pieces are expected to return on display in the Etruscan Museum. Washing of the pieces in de-mineralized water with special controls on the soluble salts. 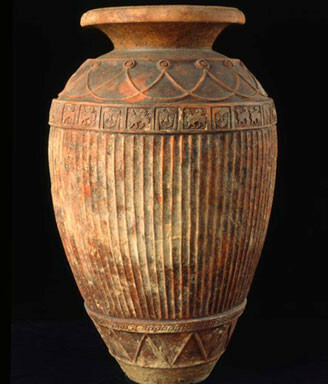 Read more about these Terracotta Vases and restoration needs.